Over the past few weeks, I have added some finishing touches to several areas of the layout. I installed some black skirting at the bottom of the fascia from just east of Big Chimney, WV around the isle to Logan, WV. The material was purchased at Banasch Fabric Outlet and is held in place with wooden clothes pins. I used a hot glue gun to fasten the clothes pins to the back of the fascia and the bottoms of the control panel and bill box support boards. All of this took about two hours, including the 40 minute trip to the store and back to purchase the material. Here's a look at the finished product. I also found a permanent (at least I hope) solution for the bill box labels on the layout. As a short-term solution, I printed up the names of the locations represented by the bill boxes on Avery labels and applied them to each box. For the permanent solution, I printed up the same Avery labels but used a white font with a black background. I think this looks a little less obtrusive but still allows the crews to be able to read the labels clearly. I inserted the labels, without removing the backing, into 3 1/2" clear file tabs and then trimmed the tabs to fit the lael. The tabs were spray painted with a matte finish prior to installation on the bill boxes in order to reduce the reflection from the lights. The last addition was a schematic drawing of the layout that was mounted at each town, yard and junction. I got this idea from Bob Bartizek and his beautiful Pennsylvania & Western layout which you can see here: http://www.pennwestrr.com/. The schematic drawing helps the operators know where they are on the layout in relation to other locations on the layout. 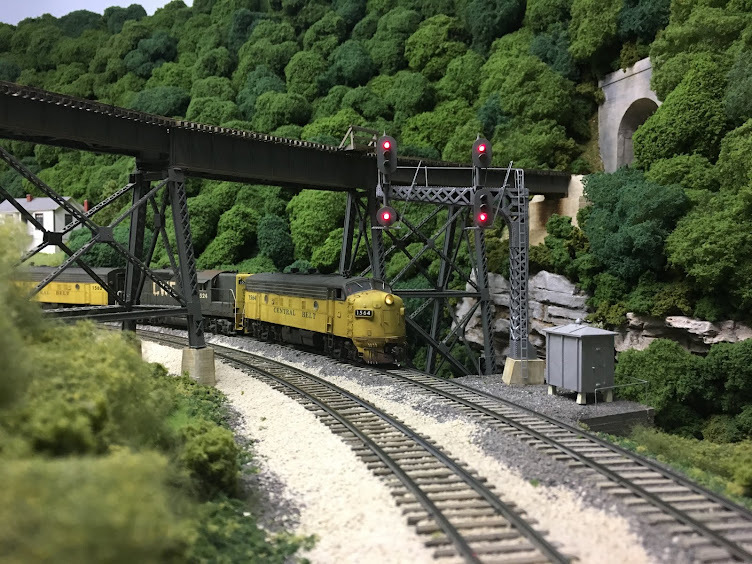 These finishing touches have really improved the overall look of the layout and will hopefully help the crew feel more comfortable when operating the layout.